When we let our conscious mind rest for a little while on the “bench” our subconscious mind takes control of our actions. And in there, all of our secrets that we search for can be found. This means that if we manage to keep our conscious mind busy or resting we can observe our subconscious mind through our actions. That’s the whole philosophy behind this test of doodling. And yes, something as innocent as the act of doodling can shine light on your greatest secrets. In fact, those innocent acts are one of the best ways psychiatrists dig into people’s subconscious. However, now we will let you be your own patient and psychiatrist, and dig into your own subconscious to discover what hides there. Take a piece of paper, a pen or pencil, and start doodling whatever you want. Just take a 5 minute break. Put your pen in your hand. And start drawing. Just draw. Put your mind into automatic and draw. It’s relaxing and fun. And you deserve a little break. 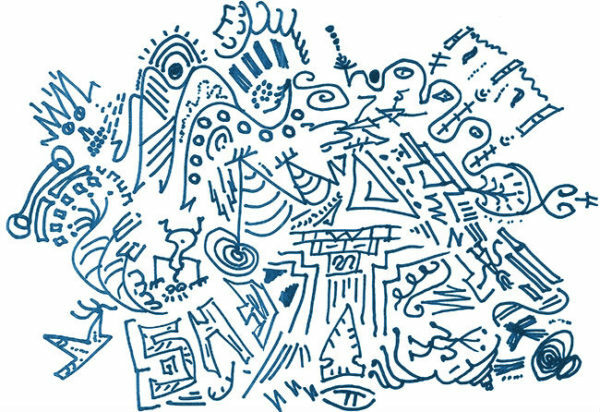 After you finish doodling, see what you have drawn and read what it says about you below. What the images you’ve been doodling say about you? This kind of doodling is by its very nature vain and self-centered. An abundance of personal thoughts and inscriptions scribbled onto a piece of paper during a conversation is a sign that a person is deeply self-absorbed. These are a sign that you have firm aims and convictions, you more or less never hide your opinions from others, and that you are persistent. It’s also an indication that you’re overly cautious and excessively vigilant. Round objects, either connected to each other or drawn side by side, indicate that you have a desire to connect with others and work together. They are a sign that you feel lonely and disconnected from the rest of the world, and that you feel that you don’t get enough attention from others. The animal which you draw might be a direct indication of the emotions you feel on any particular day. If it’s a tiger or a wolf — you’re hiding pent-up aggression; if it’s a fox, you want to do something cunning or sly. Drawing a hare or a squirrel is a sign that you’re longing for attention and protection; a lion suggests feelings of superiority over everyone around you. If you draw the same animal time after time, that means you compare yourself to it and ascribe to its behavior or personality. Other people’s problems aren’t very important to you and you aren’t really interested. Perhaps you’re going through your own low-level emotional crisis, with your thoughts moving in circles around your own hard-to-grasp problems. You feel the need to observe your own behavior and stop arguing with those around you. This is the direction according to which your life is orientated. An arrow pointing upwards is a sign that you’re orientated towards others; downwards, you’re focused on yourself. To the left means you look to the past, whilst if it points to the right you’re looking to the future. You want to be at the centre of attention, and it’s important to you to be conspicuous. If the stars which you draw have many different points or they’re separate from each other, this might be a sign that you are depressed. Beautiful flowers and the Sun are a sure indication that you are satisfied with what’s going on right now. The chances are you’re fantasizing about something wonderful going on in the future. Such doodles indicate an optimistic personality and a sunny disposition. Crosses might indicate that you have feelings of guilt before someone close to you, or that a certain problem which you feel responsible for is weighing heavily on you. Symmetrical shapes demonstrate a love of order and an inclination for planning and calculating things thoroughly. They can also indicate that you know exactly what you want, and that you will stand up for your opinions. This kind of doodle is an indication that you’ve ended up in a highly unpleasant (or at the very least, awkward) situation. If you draw chessboard patterns often, then you’re probably suffering from personal issues hidden away in your mind and which are connected with an inability to deal with something. They can also be a sign that you have serious doubts about where you are going in life. You strive for peace and harmony, and want to better arrange your life. You may also be seriously thinking about starting a family. I hope this simple test helps you to get to know yourself a little better, because, the greatest knowledge you can obtain is the knowledge of yourself.